Can you figure out how many sets I used to make this fun card? Well I am going to tell you, and what I used of each set with the set linked up. I used Tumbled Glass and Broken China distress inks to make the sky, then used On Point Glue to affix the right side cloud, a thin foam tape to affix the sun and then thicker foam dots to affix the left side cloud, in order to give multi layer dimension. Using double stick tape I affixed the fence, and the grass panels. I then went back to the On Point Glue and added the remaining elements. Foam dot on a couple of paw prints and sentiment bubble with foam tape on the pup finished off this 5x7 card. 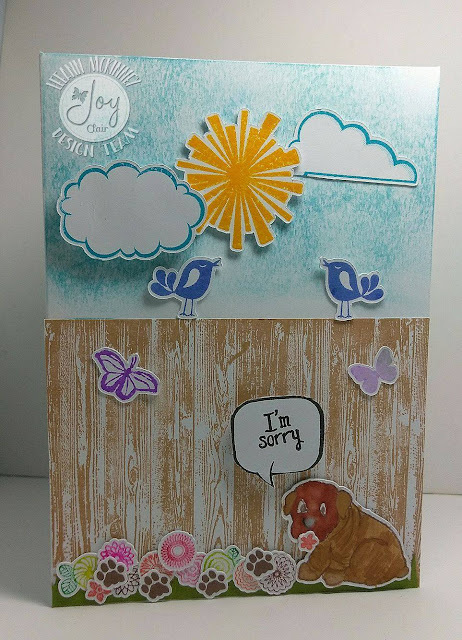 Sometimes, we do something that we aren't proud of and need to apologize for, and sending a card as cute as this should hopefully help. Hope you have enjoyed this project, please come back again to see the next project.